Usually A5 or 3rd A4 for delivery door to door, as loose free sheet inserts and for pick up points, the Flyer is usually printed in single or full colour. A well designed flyer makes sure your message hits the mark. 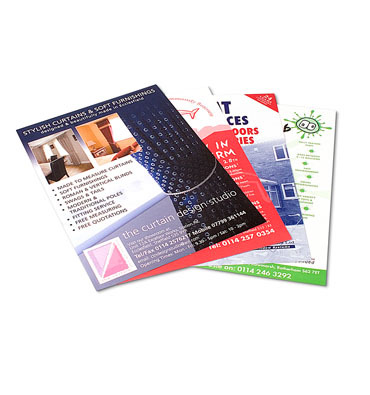 Printed on a variety of paper types and often on 80g white or tinted paper in a single colour for economy, the flyer is a popular and economical advertising medium. Don’t underestimate the quantity of Flyers you will need if you are flyer dropping door to door. As with most forms of print it is far more economical per unit to order a minimum 3 months requirement than to reorder small quantities each month. Print prices start from as little as £120 for 5000, A5, full colour both sides, printed on 135gsm white gloss. Price per flyer is 2.4p.